My two, or maybe three, favourite times of the day have to be breakfast, brunch, and dinner. With breakfast, you get delicious poached eggs or fluffy chocolate chip pancakes; with dinner, you get steaks, roast chicken etc; and with brunch, it’s just a yummy combination of the two! Lunch, on the other hand, has never appealed to me – the same old vegetarian sandwiches from any supermarket or famous coffee chain just don’t do it for me. 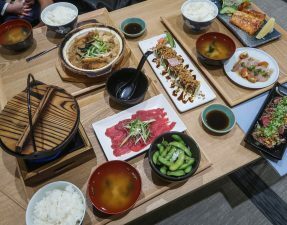 However, thanks to the ever-growing street-food trend, items such as heart-warming phos or pizza by the slice are beginning to take over our boring lunch-time staples! One new trend in particular is a quick and light Mexican burrito to go! You’re all familiar with Tortilla (I didn’t find this to be amazing), but this time I was recently invited by a new Mexican competitor to check out their halal offerings. 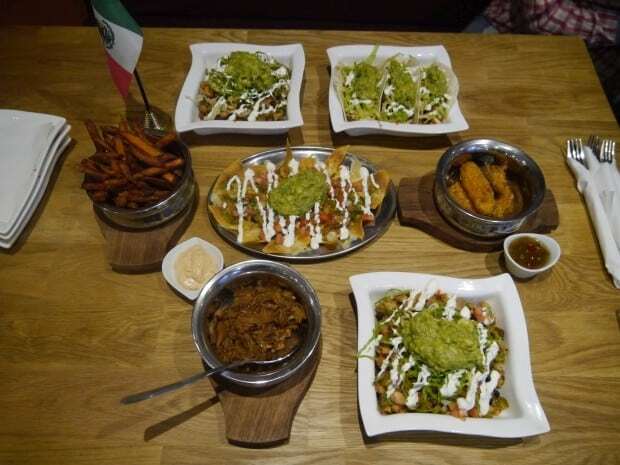 Hombres Mexican Kitchen is situated on Rayners Lane and although they have pork and non-halal beef on their menus, they also offer halal chicken and lamb. So I grabbed two of my friends and off we went for some yummy, cheesy Mexican! 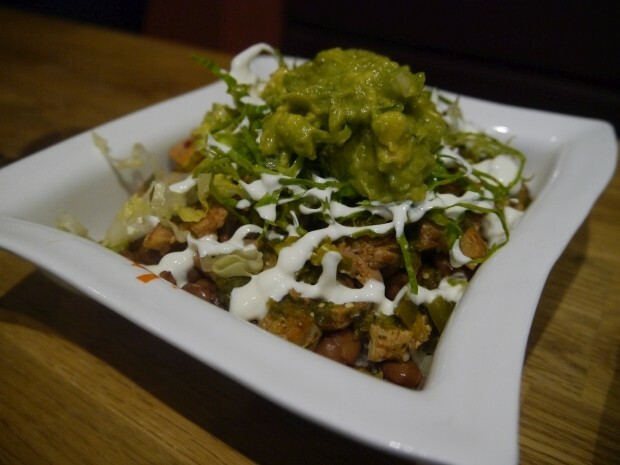 When you walk into Hombres, you are greeted with an open kitchen where you can watch them quickly whip up your order. There is also seating available both upstairs and downstairs, and after placing our order, we made ourselves comfortable in the downstairs seating area. The food was a little slow coming to the table but they had decided to bring everything out at once! 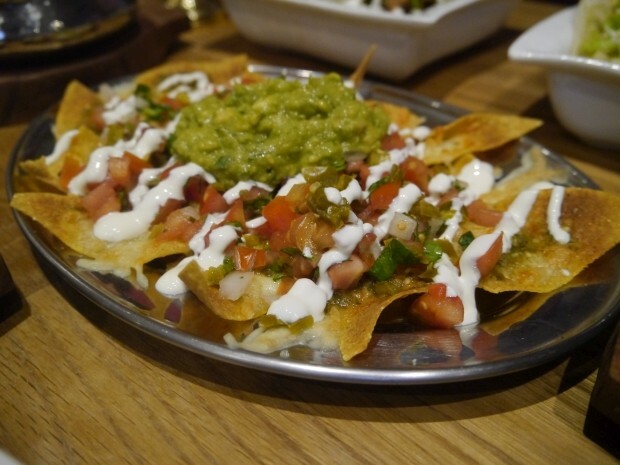 A plate of tortilla chips arrived topped with melted cheese, guacamole, sour cream, pico de gallo and some salsa! Because they had microwaved the tortilla crisps plus loaded the chips with the works, they became soggy quite quickly but were nonetheless enjoyable. Fried to a crisp, I was expecting the sweet potato fries to maybe have been a little softer and they could have done with some seasoning perhaps. 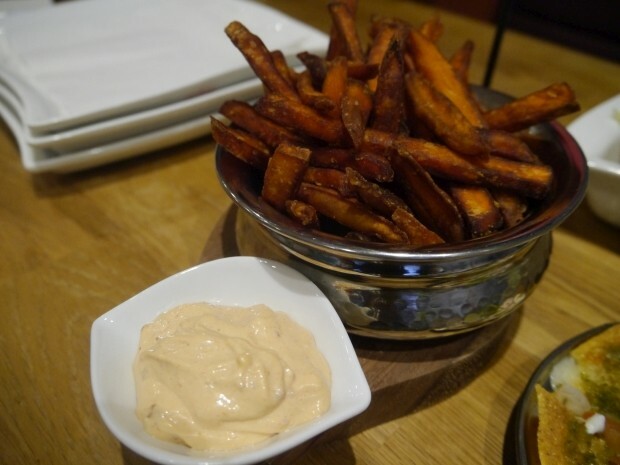 However, they did become addictive after a while when dunking them into the chipotle mayo. Deep-fried, crunchy poppers that had a delicious dollop of cream cheese and a tangy jalapeno slice inside. A simple dish that isn’t hard to get wrong! 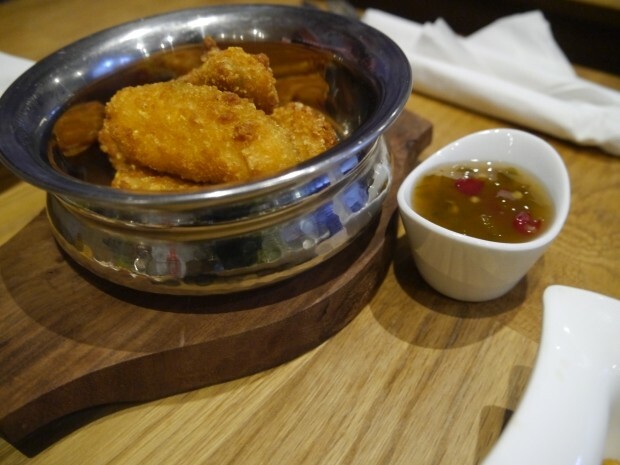 Having said that, the accompanying jalapeno sauce added a nice sweetness to each popper. This was the healthy take on the burrito – just without the flour tortilla! I opted for mine to be served with brown rice and black beans plus all the trimmings (including some yummy guacamole!). Although the chicken was well flavoured with chipotle spices, I felt that the meat was a little soft, almost mushy, and didn’t taste fresh; maybe it was an off day for Hombres. However, the rest of the condiments, especially their guacamole, went really well with the rice and beans, and I didn’t find the dish stodgy at all. I have to say, I’m a huge fan of guacamole, and Hombre’s house guac really did it for me. It was just the right amount of creamy yet chunky, and had a good flavour. 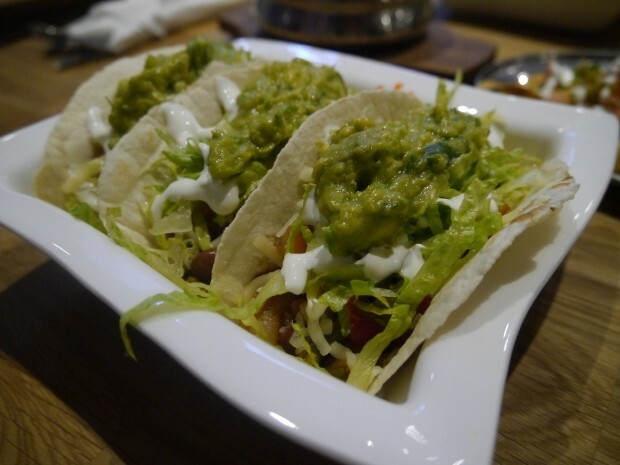 Three soft, flour tacos came piled high with roasted peppers and onions, and a huge dollop of guacamole on each one. The roasted peppers needed a massive kick in terms of flavour as the mixture seemed a little bland even when paired with the heavenly guacamole. The mini flour tortillas needed to be sturdier or there should have been less filling as the taco quickly fell apart within a few bites. I opted for this on the side because it sounded really yummy on the menu. 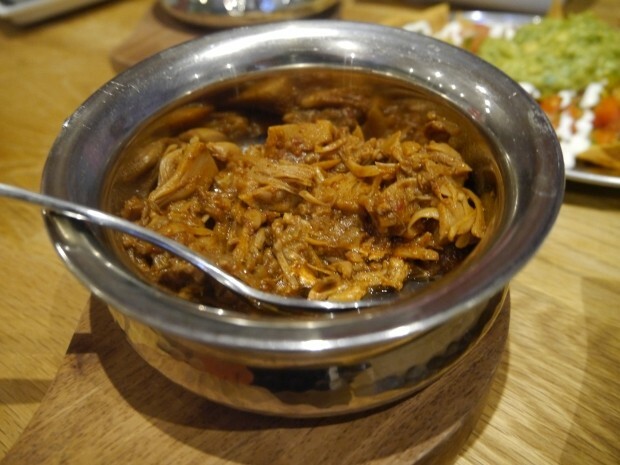 The jackfruit had been slowly cooked so that it fell apart into shreds and had the same consistency as eating pulled beef. It had a good spicy flavour and would have been absolutely delicious in a taco. The total bill amounted to £24, including drinks, so £8 each which is a great value for a quick but filling lunch time treat! 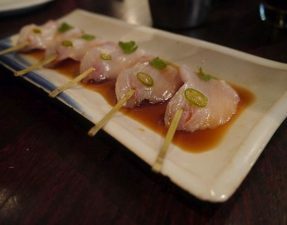 Overall, the food was okay and I wouldn’t be in a rush to head back, but I feel that they do have potential and after a little tweaking, will be perfect in no time! Rest assured, there is no cross contamination whatsoever between the pork and other non-halal meat but Hombres could have been more enjoyable had their beef offerings been halal but that’s okay – one step at a time! 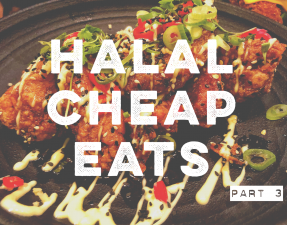 It is pretty cool seeing the boring old sandwich being tossed aside in favour of more interesting lunch-time offerings, and with places like Hombres beginning to serve halal chicken and lamb, who knows what yummy lunch time trend will offer halal next! Ah, thanks for letting me know – will amend!